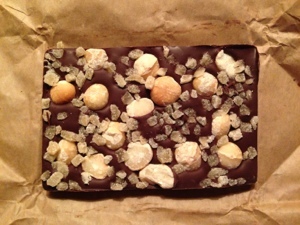 My daughter had this bar custom poured for me with hazelnuts and bits of candied ginger. This one was enjoyable, but not great. The nuts tasted fresh and the ginger mild (not as spicy as others I’ve had). The chocolate was creamy with mild cocoa flavor and tasted like others I’ve had in the area of 60% cocoa. While the cocoa flavor was good, it was too mild for my taste and this chocolate was too creamy, making it almost reminiscent of a dark milk chocolate. Posted in Chocolate. 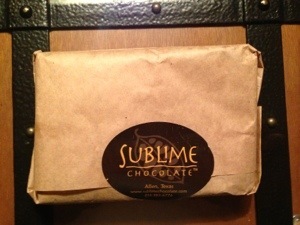 Tagged Sublime Chocolate. 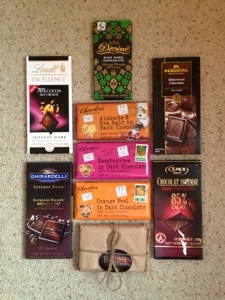 My youngest daughter, Natalie (8 years old), researched and located the highest rated chocolates that are available in the area,then purchased this collection as a Christmas gift for me. It was obviously an early one. I’ll start tasting these soon and post my findings here. Stay tuned!